Most feet manufactured by us are ball bearing feet (PAB bearing AVF). Those are made from a few specially shaped metal, acrylic or lignofol details, allowing bearings to be mounted. The feet are characterized by functional shape and unobtrusive design. On the other hand they greatly increase the reproduction of sound. 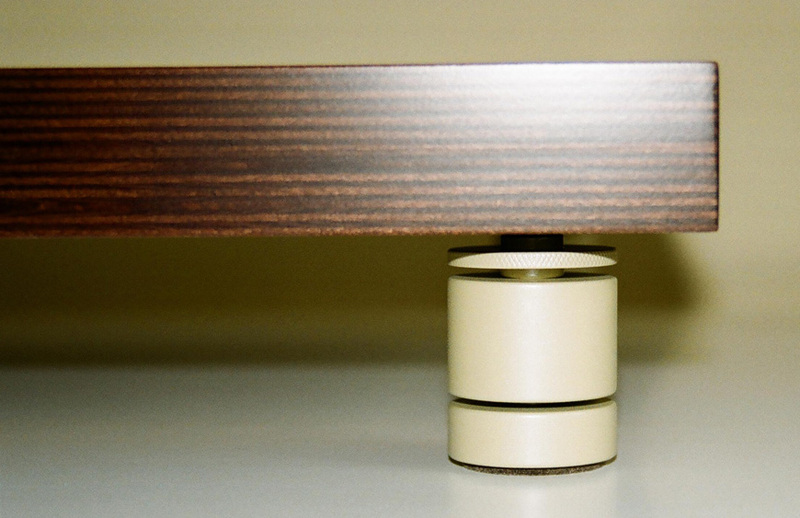 The feet are designed to replace spikes in audiophile racks, platforms, stands and floor standing speakers, or to be placed directly under electronic devices. 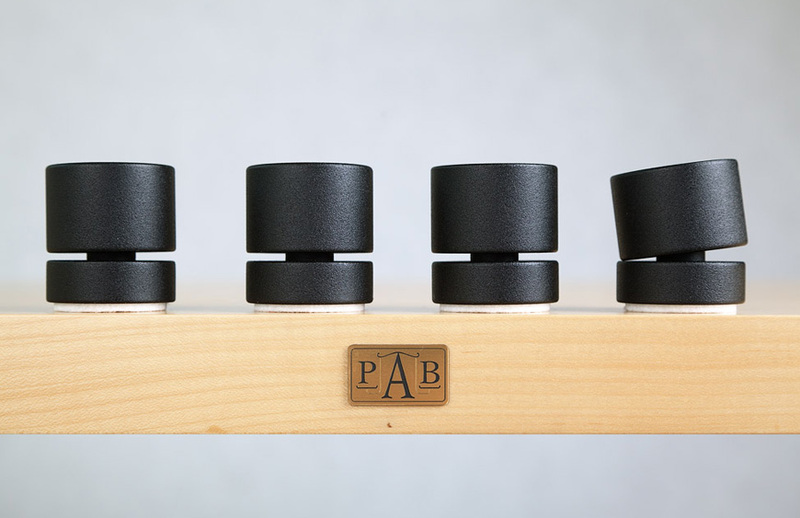 Due to the simple shape and small size (our biggest ball bearing feet have 2.4" height and 3.2" diameter), the PAB bearing AVP are splendid to be mounted in the legs of audiophile furniture, so that they are almost invisible. Due to that we used them in our prototype modular rack for inter-connecting the individual segments. The housing for the bearing feet are made of metal alloys or stainless steel. We use roll bearings from renowned companies. Depending on their size (usually the feet have 1.2-2.4" diameter and similar height) and materials used, the weight of 1 feet is 0.7-2.7 lb. The load capacity of 1 feet depends on the bearings used (standard, angular contact, self-aligning) and is between 22.0 and 66.0 lb. This means, that on 4 feet we can support devices weighing 88-264 lb not diminishing their anti-vibration capabilities. 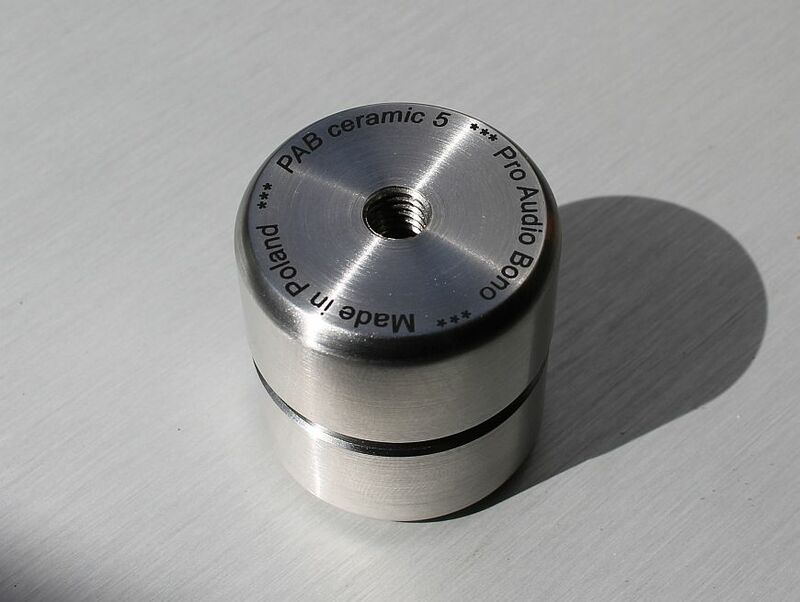 On the fifth anniversary of the Pro Audio Bono introduced for sale footer ceramic bearings − PAB ceramic 5. They have better insulation properties as bearing steel feet. This involves a much higher hardness sintered ceramic with respect to steel and therefore also with less friction. Moreover footer with ceramic bearings are more convenient to use. Bearing this in fact you do not need to lubricate, rarely also need to be cleaned. Unfortunately feet are much more expensive than comparable steel bearings footers, mainly as a result of higher prices 3-4 times ceramic bearings. 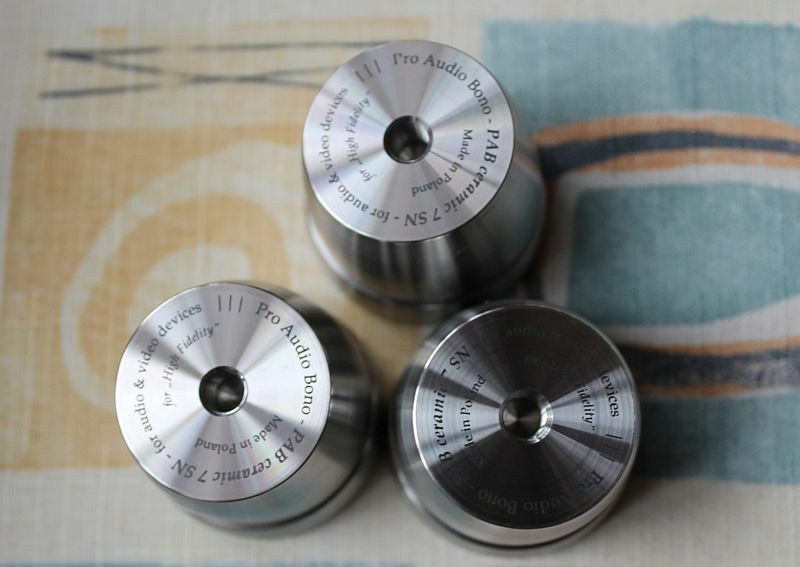 The top Pro Audio Bono feet are: PAB ceramic 7 SN and introduced for sale on the 8th anniversary of our company – PAB ceramic 8 CT. They are made of stainless steel, cheaper than nickel alloys (monel and inconel) and ceramic bearings made of silicon nitride and tungsten carbide, and therefore the hardest sinters used in the production of rolling bearings.